My notes for this column have kept getting bigger and bigger. Wow, it seems a boom-time to publish things on Tolkien, and it's hard to keep up in terms of knowing what's out there, as well it being an expensive proposition even to pick up the best. This list is mainly based on US publications, though I had added information about a few British releases that aren't scheduled for US publication. And I've left out calendars for now--I'll cover them in a future column. Let me begin with Tolkien's American publisher. Houghton Mifflin has recently reissued the hardcover versions of The Book of Lost Tales Part One (ISBN 03953454390) and The Book of Lost Tales Part Two (ISBN 0395366143), each priced at $30.00. These titles haven't been available in hardcover for a long time, so this would be a good chance to get them in this format. 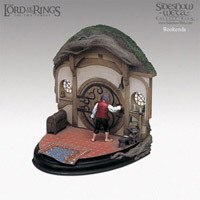 Also recently released is Gary Russell's The Lord of the Rings: The Art of the Two Towers (ISBN 0-618-33130-1 $35.00). This is the companion volume to last years book on The Fellowship of the Ring. It traces the development of the imagery of the second Peter Jackson film from artistic conception through the full-screen realization. And here are the Houghton Mifflin publications for the rest of the year. Some of the publication dates are not precisely certain. Thanks to Clay Harper of Houghton Mifflin for the details. Personally, I'm eagerly awaiting the new "revised and expanded edition" of Tom Shippey's first book on Tolkien, The Road to Middle-earth, which is coming in trade paperback sometime in June (ISBN 0618257608 $13.00 trade paperback). This is a classic book on Tolkien, and it is one of the first books to read if you're interested in Tolkien's literary background and what went into his creation of The Hobbit and The Lord of the Rings. "Middle-earth was born as a response to the Great War, and it is this foundation of tragic experience that underlies its power. Far from being an escapist, Tolkien used his mythic imagination to transform the cataclysm that engulfed his generation. While other artists surrendered to disillusion, he kept enchantment alive, hammering fairy story into a form relevant to modern times. Tolkien's mythology is a fugue on despair and hope, death and consolation. It is a protest, too, against totalitarianism and the machine, the twin evils that came to obscene prominence in 1914-18. But Tolkien's War shows how the invention of the hobbits in the 1930s finally gave Tolkien the means to write the "War novel" that he had been struggling to get out for twenty years: The Lord of the Rings." Also up for October (though Amazon says September) is Brian Sibley's Maps of Tolkien's Middle-earth, which is a slip-cased collection of Sibley's four map-booklets, including three that have previously been available, There and Back Again: The Map of The Hobbit; The Map of Tolkien's Middle-earth; The Map of Tolkien's Beleriand and the Lands to the North; and a new one for N�menor. These are all illustrated by John Howe, and look quite nice (ISBN 061839110X $29.95). Next up is what looks to be the most desirable reference book of the season. Tolkien scholars Wayne G. Hammond and Christina Scull have done a two-volume J. R. R. Tolkien Companion. The first volume is a Reader's Guide, which the publisher describes as follows: "The Reader's Guide includes brief but comprehensive alphabetical entries on a wide range of topics, including a who's who of important persons, a guide to places and institutions, details concerning Tolkien's source material, information about the political and social upheavals through which the author lived, the importance of his social circle, his service as an infantryman in World War I -- even information on the critical reaction to his work and the Tolkien cult." The second volume is a Chronology, described as follows: "Chronology details the parallel evolutions of Tolkien's works and his academic and personal life in minute detail. Spanning the entirety of his long life including nearly sixty years of active labor on his Middle-earth creations, and drawing on such contemporary sources as school records, war service files, biographies, correspondence, the letters of his close friend C. S. Lewis, and the diaries of W. H. Lewis, this book will be an invaluable resource for those who wish to gain a complete understanding of Tolkien's status as a giant of twentieth-century literature." Each volume is probably going to be over 800 pages. They will be sold separately--Reader's Guide (ISBN 0618391010 $35.00) and Chronology (ISBN 0618391029 $35.00)-- and as a slip-cased set (ISBN 0618391134 $70.00). Towards the end of October, look for a special one-time only limited edition The Lord of the Rings Bookend Gift Set (ISBN 0618401210 $75.00). 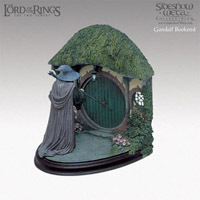 This set will include a movie tie-in hardcover one-volume edition of The Lord of the Rings with unique art on the cover, plus (by special arrangement) the Sideshow bookends set of Gandalf and Bilbo at Bag End. Here are the two bookends. And then in November comes the next crop of film books. These will have a National Laydown Date of November 5th. There are four books again, two aimed for adults and two aimed for children. The Lord of the Rings: The Return of the King Visual Companion, by Jude Fisher (ISBN 0618390979 $18.95 hardcover). This will be the same format as last year's Visual Companion for The Two Towers, but it will be eight pages longer. The Lord of the Rings: Weapons and Warfare by Chris Smith with John Howe dual edition (ISBN 0618391002 $17.95 oversize paperback; and ISBN 0618390995 $24.95 hardcover). Here's the publisher's blurb on this book: "Hundreds of exclusive images create a detailed tour through the major and minor battles of the Lord of the Rings film trilogy. As the memorable experience of watching The Fellowship of the Ring and The Two Towers shows, Peter Jackson's epic movie trilogy is destined to become the most exciting action-adventure series ever filmed. Given its vast cast of characters spread across an enormous imaginary landscape, many fans are eager for a more detailed look at the strategy, weapons, and armor from each onscreen clash. It's all here: from the Last Alliance to the Mines of Moria, from the Battle of Helm's Deep to the flooding of Isengard, and from the massive Battle of Pelennor Fields to the Black Gates of Mordor and beyond. Weapons and Warfare provides specially commissioned battle plans and an in-depth analysis of the action and outcome of each encounter, all lavishly illustrated in full color. Here too readers will find a photographic record of all the weapons and fighting styles specific to each culture: dwarves, elves, hobbits, wizards, the men of Rohan and Gondor, the different races of orcs, Easterlings, and more." The Lord of the Rings: Gollum by Brian Sibley with Andy Serkis (ISBN 0618391045 $11.95 oversize paperback). Here again is the publisher's blurb: "The creation, realization, and performance of the pivotal character Gollum is illuminated in words and pictures. Few of the hundreds of characters within The Lord of the Rings are as fascinating as the tormented Gollum. Though he is entirely computer-generated onscreen, his haunted personality is brought vividly to life through the extraordinary talent and performance of Andy Serkis. Serkis's voice, body, and facial movements served as the electronic blueprint for the technical wizards who conjured the character seen in the film, and it was his physical presence -- later removed digitally -- that served as the foil for the actors playing Frodo and Sam. The behind-the-scenes story of a breakthrough cinematic achievement is told in this book." The Lord of the Rings: The Return of the King Photo Guide by David Brawn (ISBN 0618390987 $8.95 oversize paperback). Once again the publisher's blurb: "A full-color introduction for young readers The Lord of the Rings film trilogy reaches its phenomenal conclusion as Frodo, Sam, and Gollum struggle toward the fires of Mount Doom through Shelob's Lair. Aragorn, Legolas, and Gimli must choose the Paths of the Dead to bring desperate aid to the besieged city of Minas Tirith in Gondor, where Gandalf and Merry have gone to rally the steward Denethor. Pippin, forbidden to accompany his friends or the army of Rohan in their long march to war, joins a mysterious rider banished to a similar fate. Spectacular imagery illuminates the story as it proceeds to the Battle of Pelennor Fields." Announced as a March book from Open Court Publishing Company, but not yet published is Jared Lobdell's The World of the Rings: Language, Religion and Adventure in Tolkien (ISBN 081269533X $22.95 trade paperback). It is apparently a revised version of Lobdell's 1981 book England and Always: Tolkien's World of the Rings. In April Ignatius Press reissued the 1984 book by Richard Purtill, J. R. R. Tolkien: Myth, Morality, and Religion (ISBN 0898709482 $12.95 trade paperback). It is apparently unchanged from the earlier edition, but it has a new preface by Joseph Pearce. And then in May came TheOneRing.net's own People's Guide to J. R. R. Tolkien, edited by Tehanu, with contributions by Anwyn, Quickbeam, Ostadan, Tehanu, and myself. It's published by Open Road (ISBN 1-892975-90-4 $16.95). More information can be found here. Apparently just released (though announced for June) is J. R. R. Tolkien: A Biography, by Leslie Ellen Jones, published by Greenwood Press (ISBN 0313323402 $49.95). July brings, from William B. Eerdmans Publishing Company, The Battle for Middle Earth [sic]: Tolkien's Divine Design in Lord of the Rings by Fleming Rutledge (ISBN 0802824978 $22.00 paperback). Coming in August from Open Road is Tolkien in the Land of Heroes: Discovering the Human Spirit by Anne Petty (ISBN 1892975998 $17.95 trade paperback). Again in August, this time from Open Court Publishing Company, is The Lord of the Rings and Philosophy: One Book to Rule Them All, by Gregory Bassham and Eric Bronson (ISBN 0812695453 $17.95 trade paperback). Also in August, from Ballantine, will be Tales Before Tolkien: The Roots of Modern Fantasy, edited by Douglas A. Anderson (editor of The Annotated Hobbit). This anthology will be published simultaneously in hardcover (ISBN 0345458540 $26.95) and in trade paperback (ISBN 0345458559 $13.95). For more information, see this article. Again in August, and again from Ballantine, is a reissue of Paul H. Kocher's Master of Middle-earth, which was first-published in 1972. It is of course outdated, but it remains a good study of Tolkien (ISBN 0345465601 $12.95 trade paperback). Also coming in August, but in England only, is a reprint of Lin Carter's 1969 Tolkien: A Look Behind "The Lord of the Rings". This book is inaccurate, and was not very good on publication over thirty years ago. It should have remained buried. How appropriate, then, to see that on the cover at Amazon.co.uk the subject's name is misspelled "Tolkein"! Gollancz is the publisher committing this crime (ISBN 0575075481 �6.99). Also in September, coming from Ballantine, is a hardcover edition of Robert Foster's Complete Guide to Middle-earth (ISBN 0345465296 $24.95). In October, and published by HarperCollins in England only, there will be a hardcover edition of Foster's Complete Guide to Middle-earth, but illustrated throughout by Ted Nasmith! This sounds highly interesting (ISBN 0007169426 �30.00)! As regards other Tolkien-related merchandizing, I can only hope that the rumors I've heard about a special edition Ken and Barbie set, with the dolls dressed up in the coronation garb of Aragorn and Arwen, are not true. Egad!